Ocean observatories are networks of instruments and sensors for measuring conditions in the ocean and atmosphere and are located in several places across the globe. These observatories have long-term power supplies and permanent communications links to shore-based stations using both undersea cables and satellite communication technology. Some of these observatories are connected to shore by cables that allow continuous power and high data transmission capabilities. Most ocean observatories utilize acoustics for observing the ocean with a wide variety of instruments designed to gather data about many ocean conditions and features. There are currently ocean observatories off both the east and west coasts of North America and in the Arctic region, and more are proposed for installation around the world, including Antarctica. There are several cabled observatories operating on the west coast of the United States, as part of the Ocean Observatories Initiative, and Canada, as part of Ocean Networks Canada. Ocean observing networks. The image on left is of the Ocean Observatories Initiative cabeled axial seamount array off the coast of Oregon and Washington. 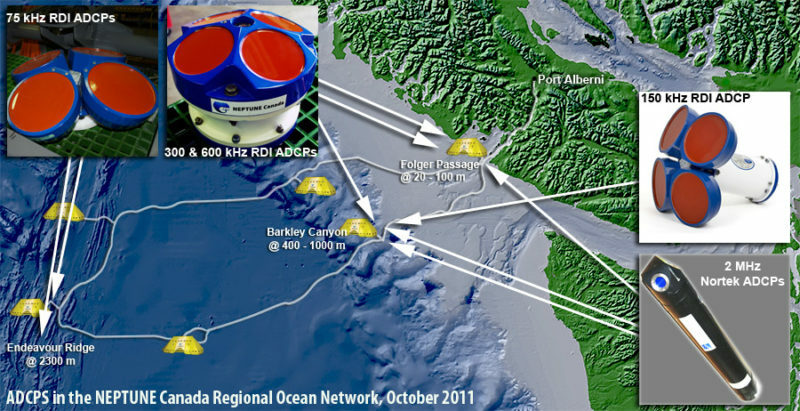 The image on the right is of the Ocean Networks Canada Southern British Columbia elements of the network. Left image copyright Ocean Observatories Initiative. Right image copyright Ocean Networks Canada. 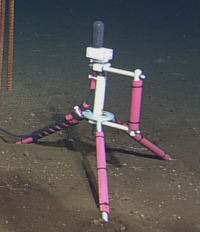 A Low-Frequency Hydrophone tripod placed on the seafloor at the Axial Base site. Photo credit: NSF-OOI/UW/CSSF; Dive R1739; V14. Creative Commons Attribution-NonCommercial-NoDerivs 3.0 United States (CC BY-NC-ND 3.0 US). Most of these observatories allow public access to the data repositories, and some provide real-time, online access to data and data visualizations. A common instrument included in these observatories are broadband hydrophones, which are passive acoustic instruments. They can be used to study many different kinds of sounds from fish sounds to ships to rain on the surface of the ocean. There are several observatories located on the Mid-Ocean Ridge, which have low frequency hydrophones specifically designed to study underwater earthquakes and volcanic eruptions, but they also detect sounds from human-generated noise and marine creatures. Recording on the Axial Seamount by a low frequency acoustic receiver (hydrophone) at OOI station station AXCC1. Recording is from 2015 around the time of an eruption at the seamount. Data from the OOI online repository. Acoustic Doppler Current Profilers (ADCP) located on the seafloor or on a mooringare used to measure currents in the ocean. Some observatories also have Autonomous Underwear Vehicles (AUV) that are deployed from the observatory site and ADCPs may be among the instruments on these AUVs. With both fixed and mobile ADCP instruments, eddies and small scale features of ocean currents can be studied in great detail at a variety of water depths, allowing a profile of the vertical structure of the ocean to be created. Map of ADCP installations in Ocean Networks Canada. Image copyright Ocean Networks Canada. Another bottom mounted instrument in ocean observatories is the Inverted Echo Sounder (IES). The IESs are used to measure the temperature profile of the water column and can also be used to measure ocean currents. Bio-acoustic sonars are designed with frequencies that profile the water by measuring phytoplanktonand zooplankton. The sonars emit sound waves at frequencies up to 200 kHz, which bounce off the tiny plankton (or any particle in the water) back toward the sensor. The signal that bounces back is known as backscatter. More backscatter indicates more plankton (or particles) in the water. The high frequency sound has a short range (see Why does sound get weaker as it travels?) so the instrument travels up and down in the water column to measure the whole water column. These instruments are deployed in both coastal and deep ocean regions. 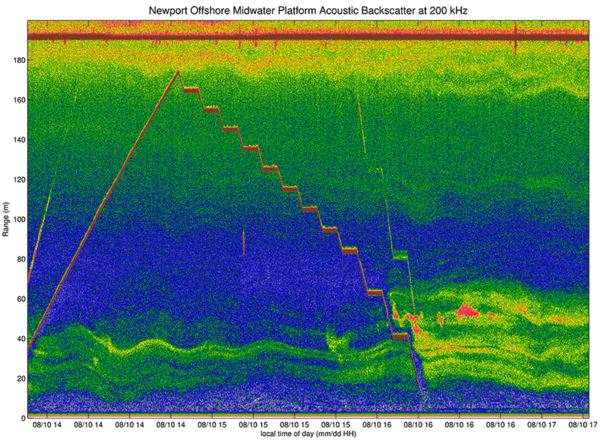 An example echogram from the bioacoustic sonar instrument on the Endurance Array Oregon Offshore Shallow Profiler platform. The profiler body is causing the solid line, as it moves up and down in the water column taking measurements. Red and yellow indicate more backscatter, green and blue are less backscatter. Credit: NSF-OOI/UW/CSSF, CC BY-NC-ND 3.0 US. Ocean observatories allow for measurements and observations to be recorded over sustained periods of time, providing opportunities for seasonal and long-term conditions to be studied. They also allow scientists to “see” what is occurring in real-time and to rapidly share their observations with colleagues and other stskeholders. 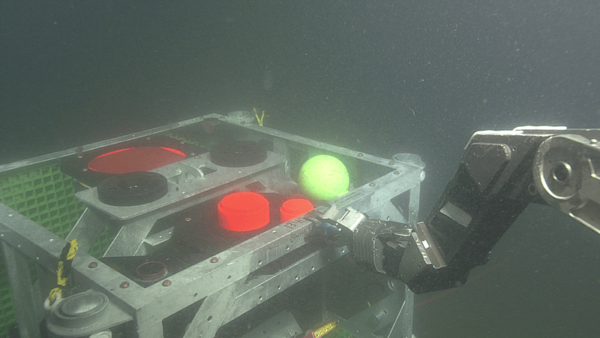 ROPOS releasing the tungsten carbide calibration sphere on the Endurance Array Oregon Shelf bioacoustic sonar platform. The transducer heads are orange. Credit: NSF-OOI/UW/CSSF; Dive R1792; V14, CC BY-NC-ND 3.0 US. People-> How is sound used to study undersea earthquakes? People-> How is sound used to study underwater volcanoes? People-> How is sound used to measure currents in the ocean? People-> How is sound used to measure rainfall over the ocean? People-> How is sound used to measure plankton? Science -> Why does sound get weaker as it travels?